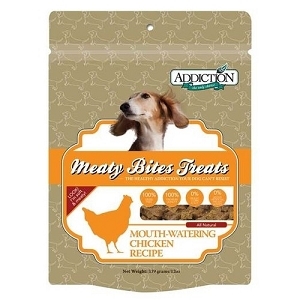 Soft, chewy, and just right for training! Even old dogs will learn a new trick when a tasty bit of beef's on the line. 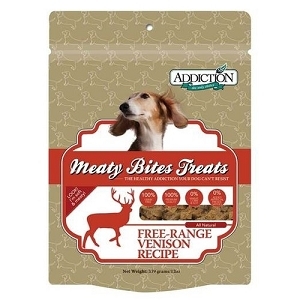 Addiction Meaty Bites Beef Dog Treats are made without any artificial preservatives, byproducts, fillers, or corn; just all-natural ingredients including free-range New Zealand beef. Toss a whole one your pet pal's way just for being so adorable or tear them into pieces and use as chewy training treats.